There were rumors all weekend that Britney had left Promise of a New Day Rehab for good, but I refused to post those hurtful rumors. Well, I didn’t so much “refuse” to post those rumors as I didn’t hear them because I was MIA all weekend. 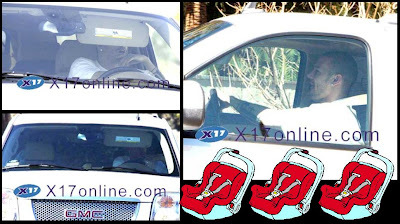 Anyway, Britney was rumored to have peaced out of rehab, but our good friends at X17Online have claimed that not only is Britney snug as a bug in a crazy rug, but KFed even brought her two kids (“what’s his face” and “the other one”) to visit her there. The good news was that Jayden was actually sitting in his car seat. I miss the good old days of the kids just being able to crawl and roll all over the car. Thanks Pam! If we wanted your “Hep-C filled opinion” we would have licked the toilet seat at a train station. Britney Rehab, Rehab Britney. So We Meet Again?